Top : Designers : Bob Ames Naval Architecture, Inc.
Bob Ames Naval Architecture, Inc. Specializes in the design of high performance planing sailboats. Let us design your next boat or choose one of our exciting production designs. We also offer existing custom designs to anyone interested in building their own. 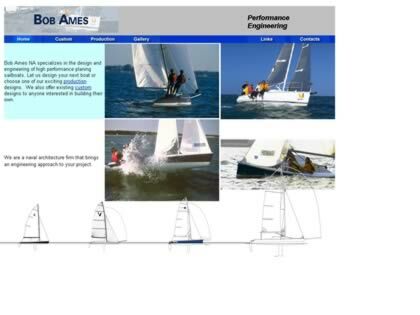 Web Site Snapshot: If available, above is a snapshot of the Bob Ames Naval Architecture, Inc. web site at http://www.bana.com/ as it appeared when this site was added to the directory or last verified. Please Note that Boat Design Net has no involvement with the above web site; all content and images depicted in the above thumbnail are the property and copyright of Bob Ames Naval Architecture, Inc. unless otherwise noted on that site. Description: Specializes in the design of high performance planing sailboats. Let us design your next boat or choose one of our exciting production designs. We also offer existing custom designs to anyone interested in building their own. Visit Bob Ames Naval Architecture, Inc.